The Sustainability Center of the Specialty Coffee Association manifests our commitment to making coffee better for everyone in the value chain. We advocate for the sustainable growth of the coffee industry through collaborative partnerships that pursue equity, prioritize mutual benefits, and result in positive impacts. We work to improve industry understanding of critical social, environmental, and economic issues through our research, education, events, and awards. The SCA has committed to organizing an industry-driven Coffee Price Crisis Response initiative with the express purpose of activating the organization, its members, and other relevant actors in the coffee industry toward addressing long-term cyclical pricing decline. The organization seeks a facilitating partner with proven experience in mapping systems and implementing systemic change over a broad range of conditions, geographies, value chain participants, and supporting structures and entities. Such a partner will have proven and demonstrable experience in facilitating the research, planning, mapping, and disposition of a set of targeted activities aimed at making systemic change. Due date the 30th of January 2019. Conducting and disseminating sustainability research is a critical activity for the SCA. While technology enables coffee industry actors worldwide – from baristas to farmers – to be more connected to one another than ever before, it can still be daunting to find the relevant, credible information they need to comprehend global-scale challenges and make decisions about how to get involved. Since 2015 the SCA has focused especially on raising awareness and publishing resources on farm profitability, climate change, and farm workers, while also amplifying work being done by other specialty coffee stakeholders to ensure that coffee, as well as the people and environments that support it, can thrive. Since 2004, the SCA has recognized outstanding work in the field of sustainability with the our annual Sustainability Awards Program, created in 2004. The projects, business models, and individuals receiving these awards are not only dedicated to confronting the enormous challenges facing our industry – from climate change to gender equality – but also to collaborating across geographies, cultures, and supply chain roles, and to to sharing the lessons they have learned for the benefit of the entire coffee sector. With each year we see greater diversity in the approaches that companies, organizations, and individuals take to confronting the challenges facing our industry. These awards reflect collaborations that happen across geographies, cultures, and supply-chain roles. Convening groups of people for an event comes at a cost to the environment: from the food consumed by attendees to the distance they travel from home to arrive, contributing factors can add up quickly, but still be largely invisible. At the same time, events are also critical to connecting people to create the large-scale changes needed to make our vision of an industry that supports thriving communities a reality. 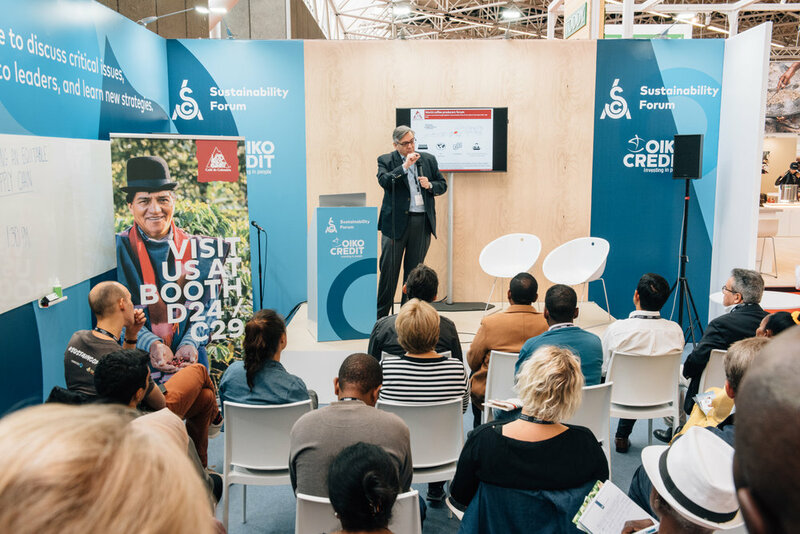 SCA hosts events of all sizes in venues around the world and, in collaboration with vendors and exhibitors, strives to reduce the negative environmental impacts of our activities while increasing their accessibility and value to specialty coffee stakeholders. The obstacles facing specialty coffee in our pursuit of sustainability are not unique: climate change, labor scarcity, and a dwindling population of would-be young farmers are issues facing every (legal) agricultural product worldwide. These challenges are so enormous in scale that no single individual or company could possibly solve them alone, defying simple solutions. Addressing a symptom of poverty and inequality, whether by building a school to combat low education levels in a community, or subsidizing the cost of fertilizer to increase yields from coffee plants may result in short-term benefit but doesn’t change the big picture. The kind of collaboration required to sustain coffee occurs not only across value chains, but also between companies, governments, and between the coffee sector and other agricultural sectors. It is complex, time-consuming work, which is why the SCA engages in initiatives like the Global Coffee Platform, the Sustainable Coffee challenge, and the International Coffee Organization on behalf of specialty coffee stakeholders – regardless of their supply-chain roles – whose day-to-day responsibilities and challenges limit their ability to participate individually in shaping the future of the industry.